While shooting on location in the South Pacific, a movie star is pursued by a handsome Naval officer who is convinced she is the girl for him. A bumbling pants presser at an upscale hotel's valet service nurses an unrequited crush on a Broadway star. He gets more than he bargained for when she agrees to marry him, to spite her womanizing fiance, and encounters Nazi saboteurs. Professor Hendricks: Are we keeping you awake, Mr. Elliot? 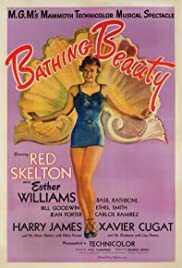 BATHING BEAUTY offers lots of eye candy and a couple of hilarious RED SKELTON routines proving he's a master at physical comedy. The musical interludes are on the dull side and don't give strong enough material to Ethel Smith (at the organ), Harry James, Xavier Cugat and Carlos Ramirez--a Latin tenor with a strong voice but no charisma. The slender plot is the usual misunderstanding that occurs in these type of ESTHER WILLIAMS movies. She thinks her newly wed hubby (Red) is the father of three boys, thanks to a practical joke played by BASIL RATHBONE (who looks as if he'd rather be elsewhere in a thankless role). She tries throughout the film to get Red dismissed from the all girl college he enters just to be near her. The highlight of the film is Red's bashful entrance into a class of ballerinas, clad in pink tutu and ballet slippers--all the while being slapped around by a ruthless instructor and going through ballet paces with hilarious results. The supporting cast is largely wasted--including Bill Goodwin, Margaret Dumont and Janis Paige in a brief role. Jean Porter gets to do more than usual and even has a song and dance number with Red. The water ballet at the finale is nicely done in typical MGM manner but not as ostentatious as usual for an Esther Williams film. This was her debut as a leading lady and she has lots of confidence and poise, both in and out of the water. In fact, it's one of her better performances--but the spotlight belongs to Red Skelton who deserves his top billing.